Paddington Bear's favourite sandwich filling is being celebrated at a festival in Cumbria. 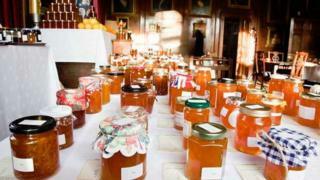 The Marmalade Festival at Dalemain, near Penrith, has attracted 2,700 entries from more than 30 countries, including Australia, Kenya, and Taiwan. Hundreds were also submitted from Japan, where the preserve is popular. Visitors included a delegation from Japan, with the Mayor of Yawatahama announcing plans to host a sister festival in his home city in 2019. Anyone can enter their preserve at the event, which is now in its 13th year, and the winner will be sold at Fortnum & Mason. The winner of the Double Gold title was Janice Miners from Cornwall, whose grapefruit and gin combination was described by judges as "zesty and fresh". Veda Karlo, a marmalade maker from New York, won an award for the most inventive concoction, with the Seville orange, cranberry and horseradish flavours "working together effortlessly". An annual feature pays a nod to the cricketing rivalry between Australia and England, with a group of marmalade makers from Buninyong in Victoria taking home the "Marmal-Ashes" trophy. The weekend-long event attracted hundred of visitors, and even though snow on Sunday led to the closure of the estate's car park, visitors arrived via a shuttle-bus from Penrith. The festival's founder Jane Hasell-McCosh said: "I think this is a very exciting time to be making preserves, as we are seeing how people's love for marmalade and creativity have led to a true embracing of the versatility of the preserve, with all sorts of interesting flavours and ingredients being incorporated. "The Marmalade community has continued to grow and I am so delighted to be involved in plans for a new Japanese festival. "I look forward to seeing the ways in which this festival will be both a showcase of Japanese-British friendship, and a wonderfully unique Japanese event."